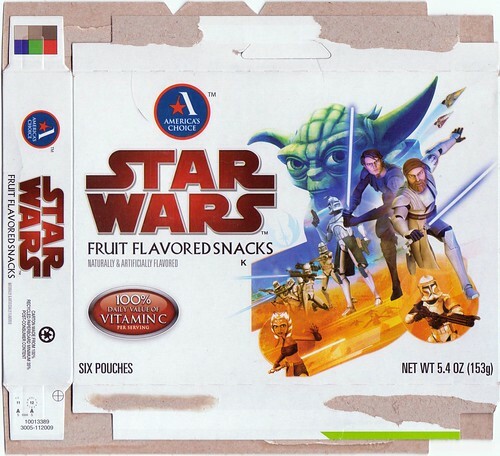 I think it's time we took a closer look at Star Wars Fruit Snacks. A fellow Spy and I have been obsessing over these for the past year, and I think it's time I shared the fruits of our labor (no pun intended). 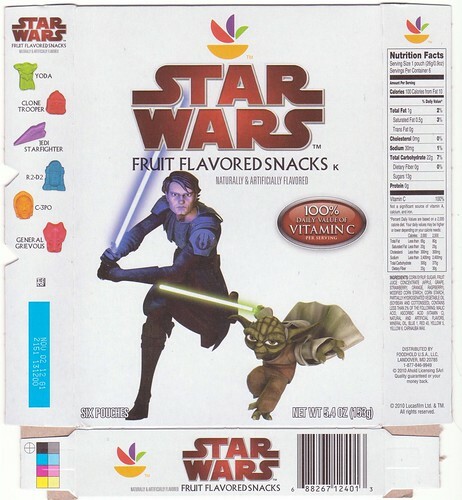 These snacks first appeared in 2010, and many of them are still available today. 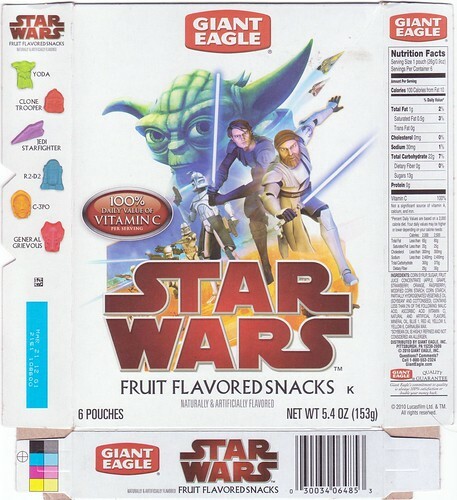 However, some companies have changed logos, and as a result some packages are no longer available. I hope to discuss each of these on an individual basis. 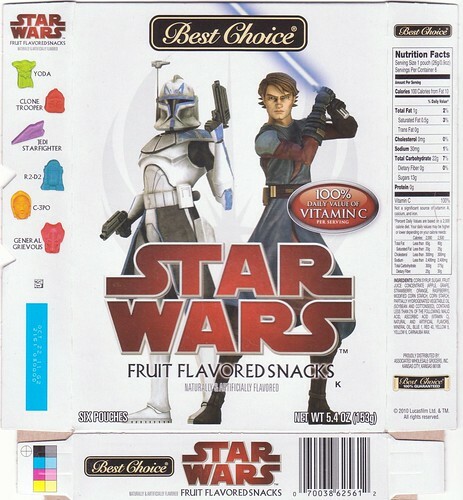 So far, all the boxes contain the same fruit snack shapes...some of which have been in use since Revenge of the Sith. 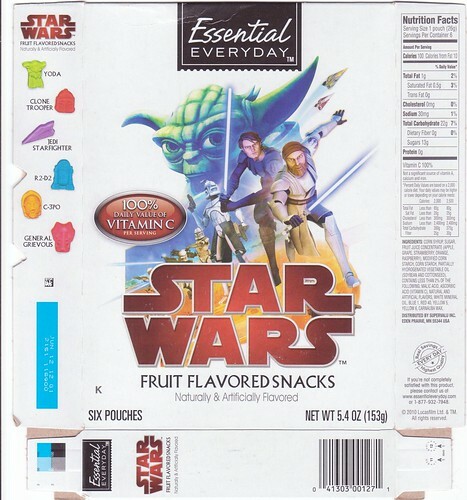 Also, all the boxes up until now have come with red and white snack pouches, with the exception of the Episode I 3D 24-pack box, which came with blue and white pouches. 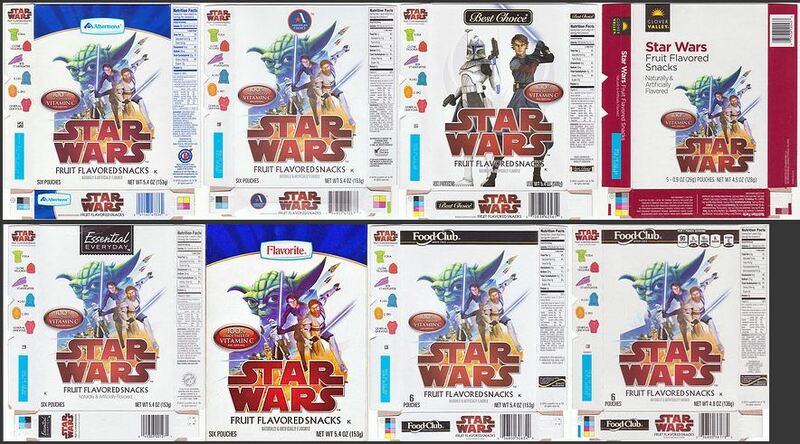 UPDATE: As of late 2012 early 2013, all boxes appear to be using the blue pouches. 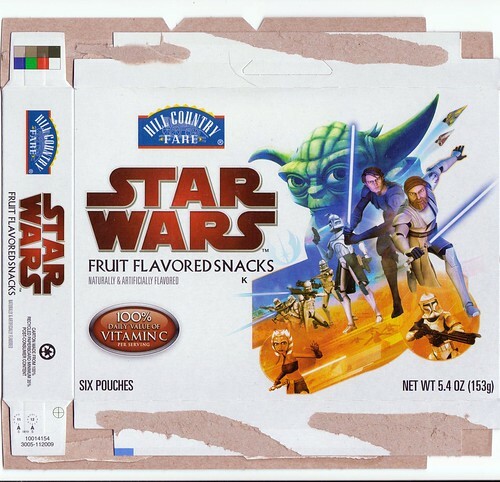 possibly a Sam's Club 50-pack....one is listed on their site but has not been discovered. Could be loose boxes shrink-wrapped together. I would like two boxes of any of the above on my Need List, or any "undiscovereds", and will compensate anyone for their expenses, shipping, and time. 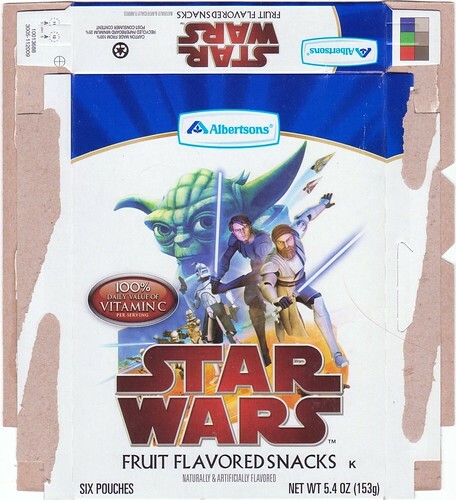 The Albertsons box has become difficult to find, as many of the stores are not carrying the Star Wars snacks at this time. Those that are may have switched to the new Essential Everyday logo, which is a brand to be carried by all SupeValu stores. As such, all store branded boxes from this family of stores may be phased out in order to adopt the Essential Everyday brand. This particular box was purchased from an eBay dealer who obtained it at a Pathmark store in Yonkers, NY in January 2012. Clover Valley is distributed by Dolgencorp for its Dollar General stores. Dollar General is a discount small-box store found in 38 different states. 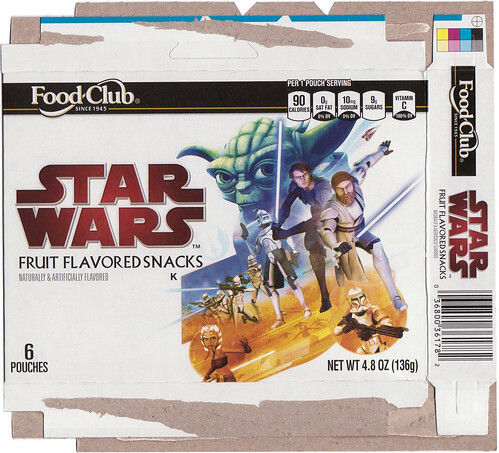 This is perhaps the easiest box to find, and it will only cost you a dollar. 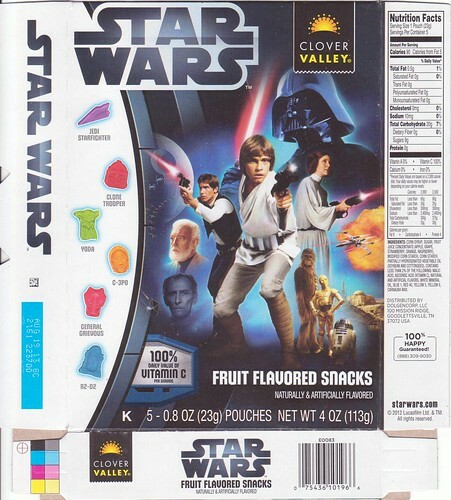 A New Hope box appeared in late 2012. As mentioned in the Albertsons post, Essential Everyday is the new "owned brand" being carried by the SuperValu family of grocery stores. 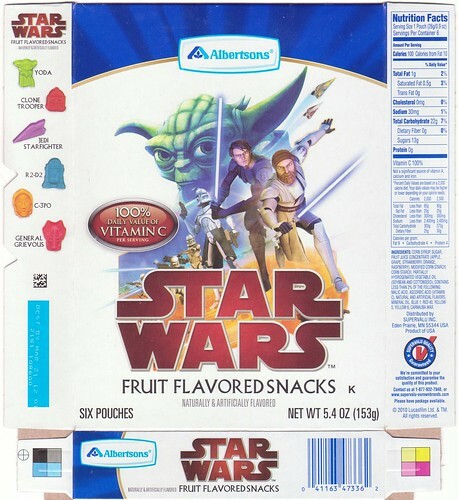 This will likely replace the store brand carried previoiusly in some of these stores, as was the case in Albertsons. 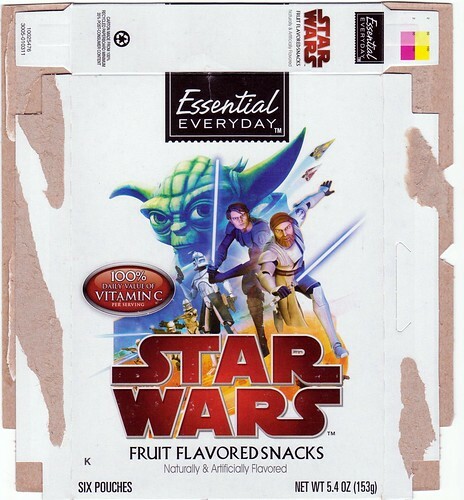 When my snack hunter looked at his local Albertsons, he found one "Albertsons" box way in the back, and a fresh selection of "Essential Everyday" filling the rest of the shelf. 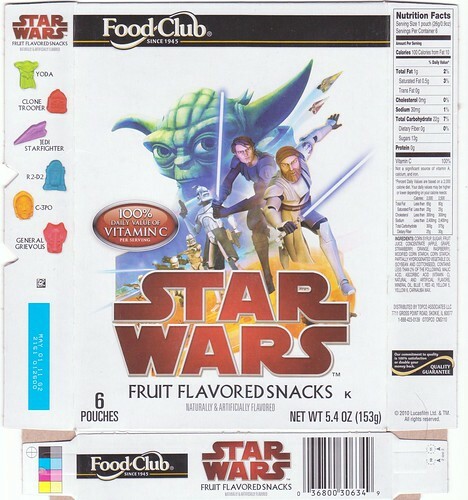 Food Club is a generic brand that caters to various grocers. It is distributed by Topco (the same as ShurFine). 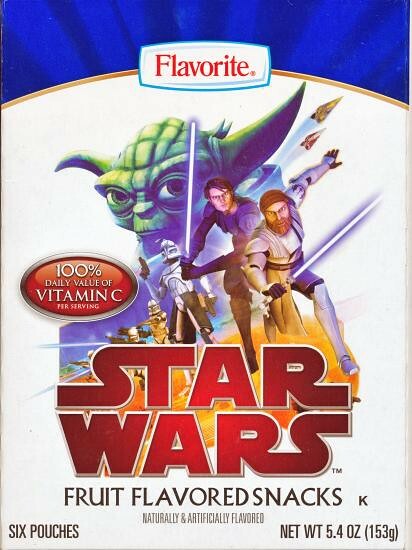 While I haven't been able to track down other sources, I suspect this could be found at multiple chains. Locally to me, it is carried by Brookshires and Super 1 Foods, which are sister stores. These stores are found mostly in East Texas and Western Louisiana, and are expanding into surrounding areas. Not every store has them for some reason, but they have been both this year and the previous year. UPDATE: A new updated box has been found. 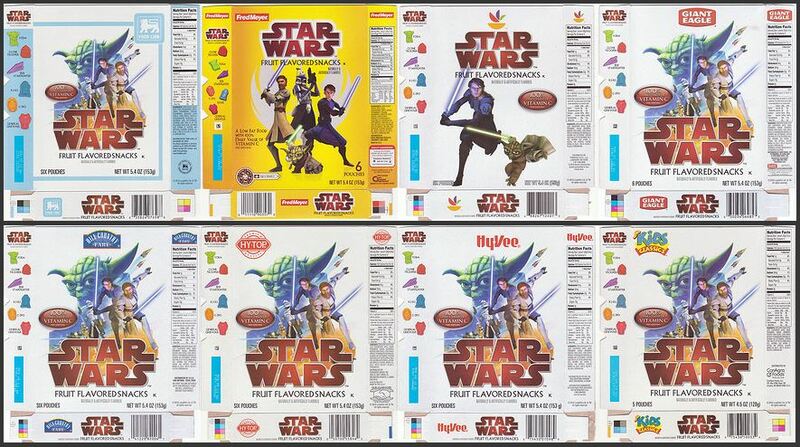 The obvious difference is that the new box has nutritional info on the front, and is only 4.8oz (still 6 pouches). 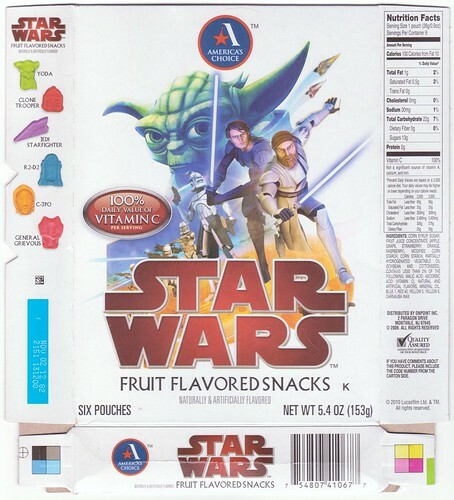 It is also dated 2011 (instead of 2010) and comes with the blue pouches previously seen in the Phantom Menace jumbo boxes. 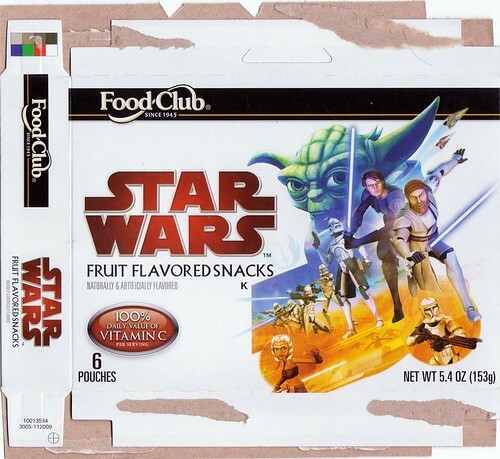 It seems safe to say that the older Food Club box is now obsolete. 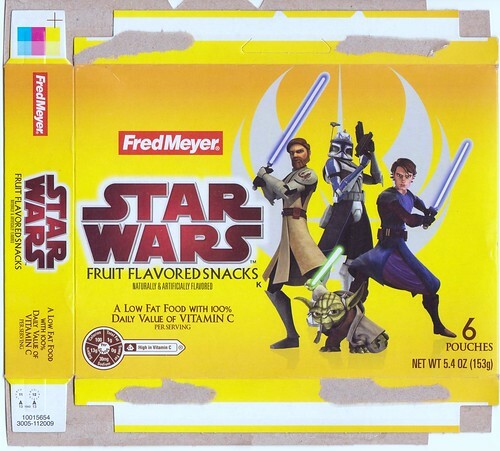 Fred Meyer is a retailer based primarily on the west coast, originating in Oregon. It's merged with Kroger and has become one of the largest grocery retailers in the country. 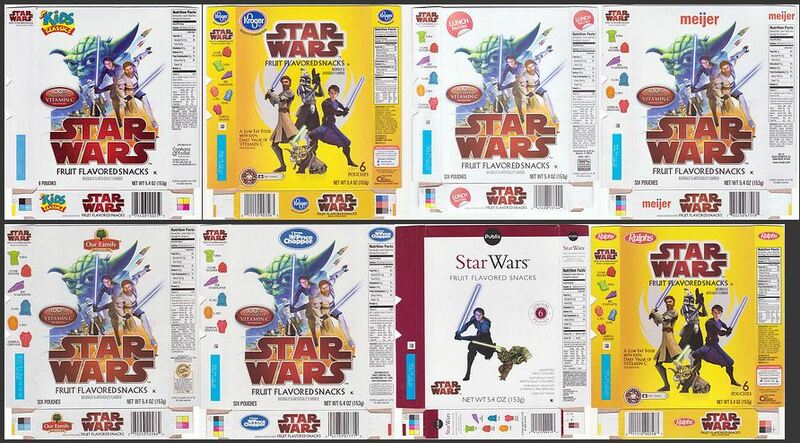 Currently, Kroger, Fred Meyer, and Ralph's all maintain their own logos on their snack boxes. 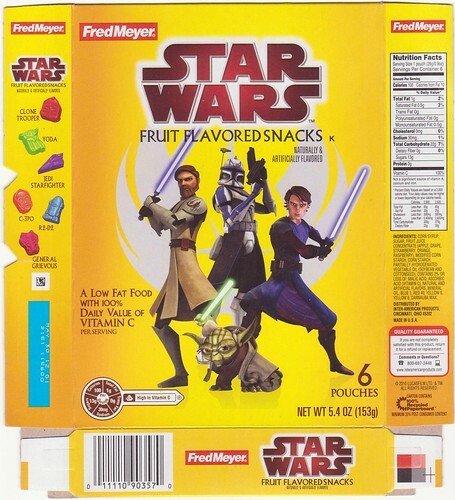 It's possible you might find a Fred Meyer box at one of the smaller Kroger family stores in Fred Meyer's territory. Cool collection darthskellington. I think I found an "undiscovered" box. 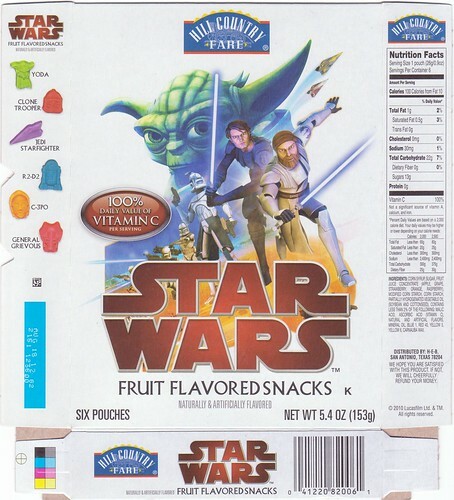 I bought a box of them at Wades and they have a "Hy-Top" logo. Can post a pic if you want. Yes, please do! 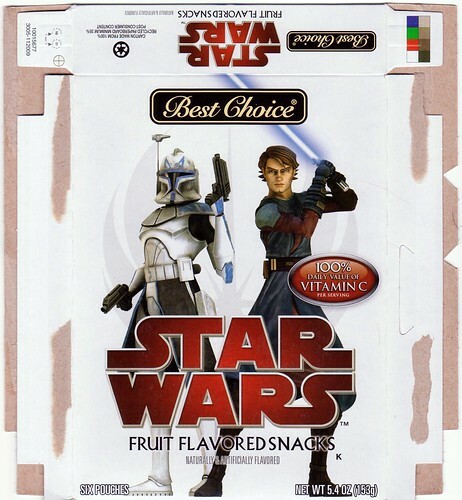 Can I persuade you to snag me a couple boxes? This one proved to be a bit of a mystery for a while, as we knew the logo, but not what store it matched up to. Giant and Stop N Shop are both owned by the Royal Ahold company. They are a sister company to Giant (Carlisle). However, they are not related to Giatn Eagle. Frankly it's rather confusing as grocery stores often start as one company, then branch off or sell parts of the company, then later to be repurchased or consolidated back into one. 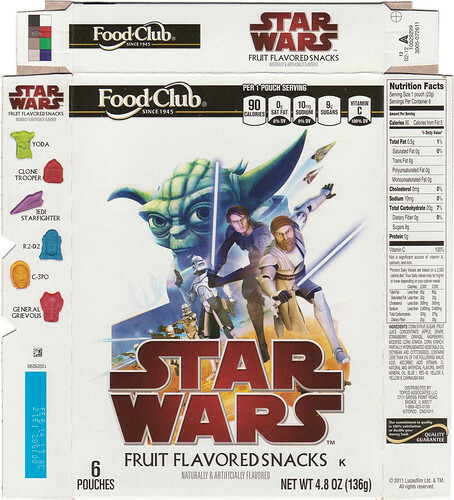 Anyway, the bottom line is that the current company logo that appears on this box, is the new logo being introduced into all of their stores. 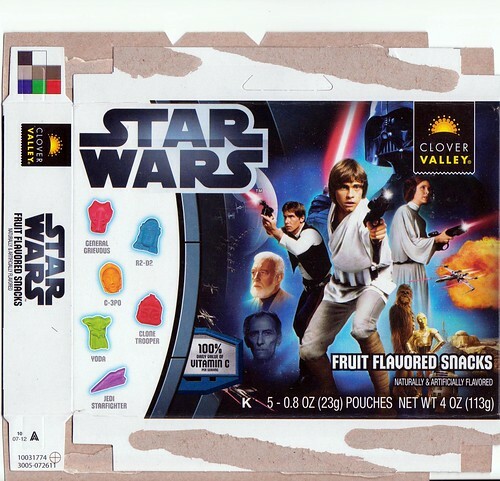 Whereas you might have previously found a box that said "Giant", you will now likely find this "fruit slices" logo. Giant stores can be found around Delaware, Maryland, Washington DC, and Virginia. 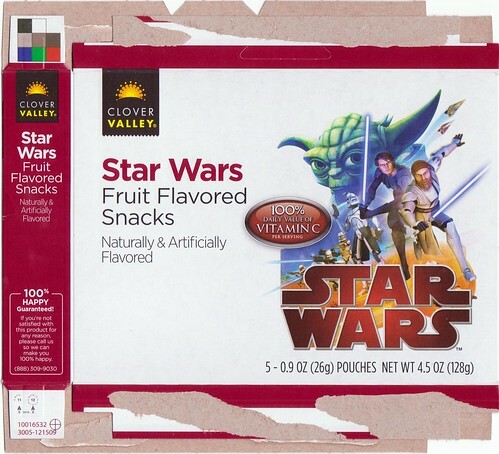 Stop N Shops are located in Rhode Island, New Jersey, New York, Pennsylvania, Connecticut and Massachusetts. Both stores have store locators on their website listing exact locations on a helpful drop down menu. 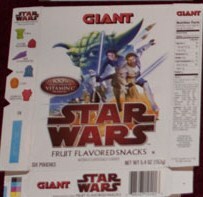 Giant (Carlisle) is the sister company to Giant (Landover). 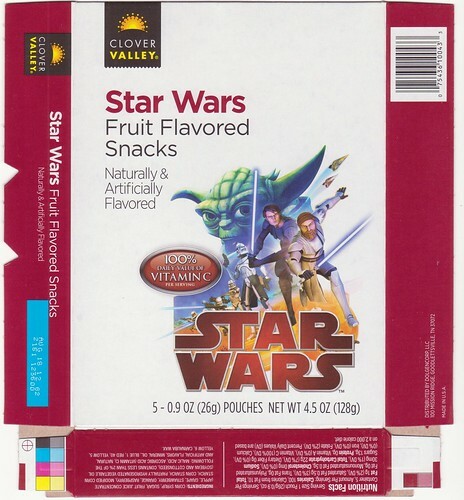 Giant Food Stores, LLC is an American supermarket chain that currently operates stores in Pennsylvania, Maryland, Virginia, and West Virginia under the names of Giant, FoodSource, and Martin's. 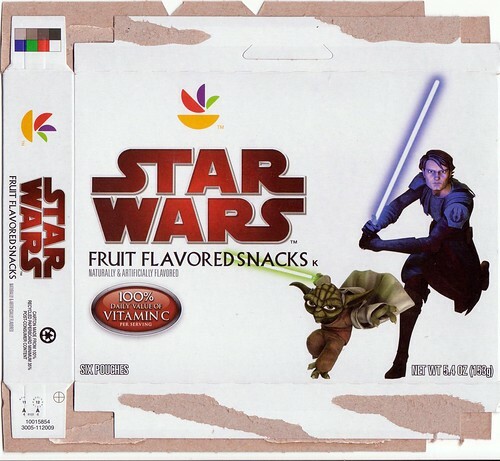 It's possible that this box logo has been replaced by the fruit slices logo, and as such may be difficult to come by now. 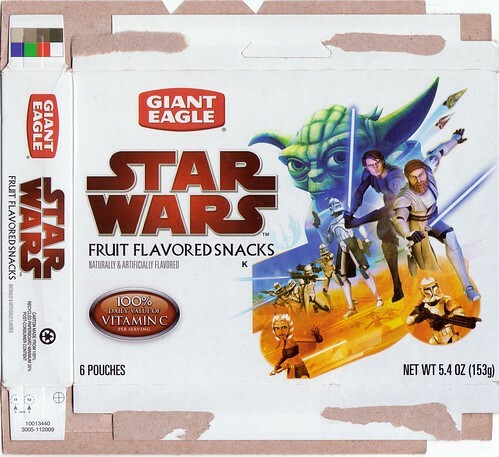 Giant Eagle is a supermarket chain with stores in the U.S. states of Pennsylvania, Ohio, West Virginia, and Maryland. This is much the same territory as the other Giant stores, making it confusing to track down. 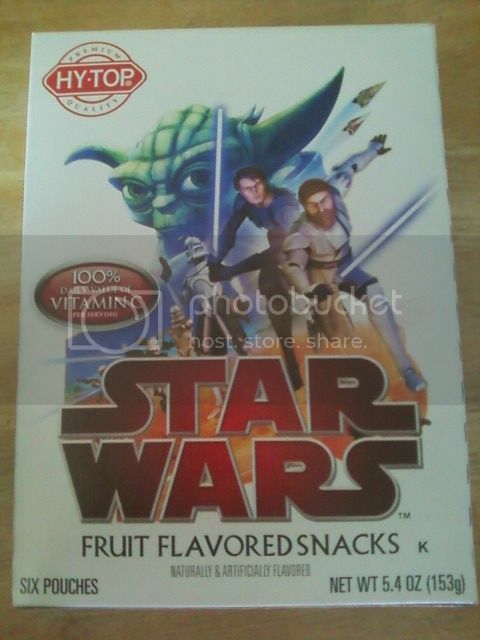 This box was obtained on eBay. Hill Country Fare is a generic brand carried by H-E-B stores in Texas. This was found in the Houston area in late 2011. HEB Grocery Company, aka H-E-B, is a privately held San Antonio, Texas-based supermarket chain with more than 315 stores throughout Texas and northern Mexico. The company also operates Central Market, an upscale organic and fine foods retailer. Sure, I'll check tomorrow and see if they have any left. I could probably help you out with the Food Lion box too if you want.